Here are some great tips and ideas for viewing the solar eclipse this summer. We get pretty geeked out about things like Solar Eclipses around here and we are so looking forward to the fact that we are going to get the chance to view one on August 21st of this year! 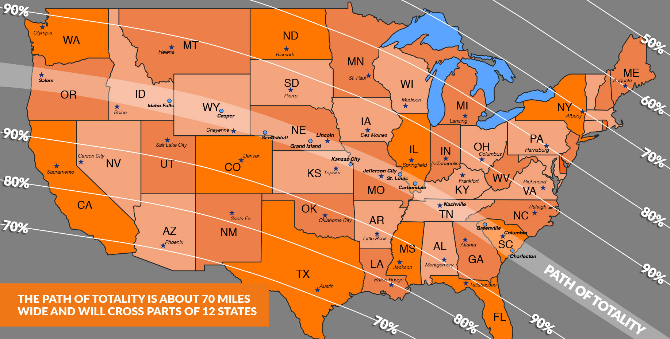 Viewing opportunities will vary by location, but those of us United States will be able to see a partial solar eclipse. In order to see the total eclipse, you must be inside the Path of Totality, and I’m so excited because several areas pretty close to use are almost perfectly in the path which will be amazing for viewing the solar eclipse here in Idaho. A total eclipse of the Sun occurs as the the Moon completely blocks the Sun. As you can imagine, this is a rare event and this will be the the first USA total solar eclipse in 38 years! People all over the country are making big plans for viewing the solar eclipse which could make things pretty hectic and crazy. Depending on where you are located, the sun may be completely obscured by the moon for up to 2 minutes and 40 seconds. During this short time frame, the moon will be completely blocking the face of the sun and day will turn into night which will expose the sun’s outer atmosphere (the solar corona) for a truly unique sight. During those brief moments when the moon completely blocks the sun’s bright face … day will turn into night, making visible the otherwise hidden solar corona (the sun’s outer atmosphere),” according to NASA’s Eclipse website. “Bright stars and planets will become visible as well. This is truly one of nature’s most awesome sights. 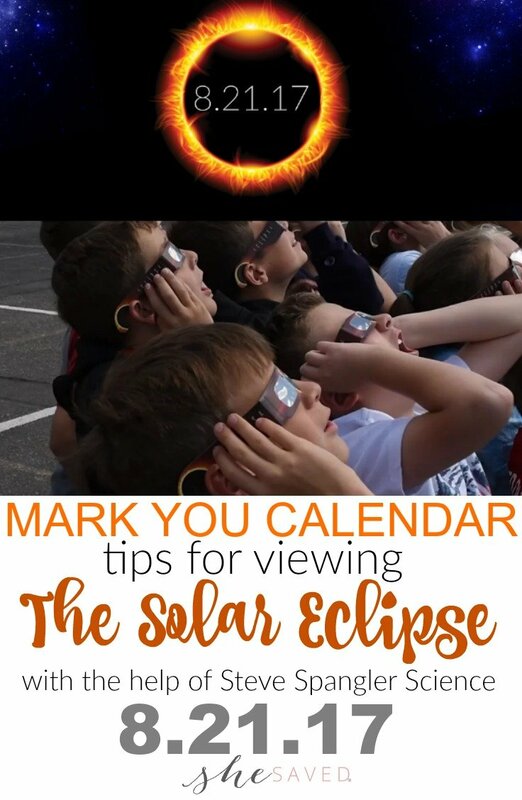 It’s super exciting, but it’s also super important to protect your eyes if you plan on viewing this amazing and rare event. Normal sunglasses will not protect from the intense rays when the moon passes over the sun, so purchasing the correct eyewear to watch a solar eclipse is important. NASA has released an information guide called How to View the 2017 Solar Eclipse Safely and one of their recommendations is that glasses meet the current international standard: ISO 12312-2. The folks at Steve Spangler Science have come up with an awesome, affordable and safe way to help you and your family view the eclipse and these glasses meet the recommended safety standard. BONUS! Receive a 32-page book entitled “Get Eclipsed” by NASA astrophysicist, Fred Espenak. This book is jam packed with cool facts and helpful hints on how to prepare and enjoy this amazing event. It’s a must have for any teacher! What a fun way to host a viewing party for the kids, and also rest assured that their eyes won’t be damaged in the process. Steve Spangler has pretty high quality science products, and their custom eclipse glasses are manufactured with scratch resistant black polymer material with an optical density of 5 or greater. This ensures that you will have the best viewing experience. SAFETY FIRST! Unlike cheap imitations, you won’t have to worry about eye safety and protection with these premium quality glasses. Our glasses filter 100% of harmful ultra-violet, 100% of harmful infrared, and 99.999% of intense visible light. CE AND ISO CERTIFIED FOR DIRECT SUN VIEWING – Scientifically tested and certified to meet the Standard for ISO 12312-2:2015. *standards for direct sun viewing safety. Our glasses allow you to view the total solar eclipse with absolute confidence in your eye safety. 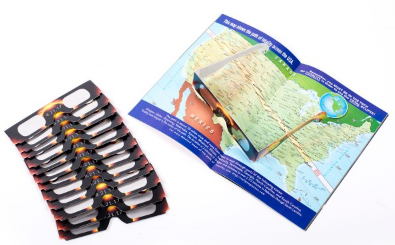 COMFORTABLE FIT ON HEADS OF ALL SIZES – Solar Eclipse Glasses feature multiple bend points allowing them to fit all sizes. They have been designed specifically to fit comfortably over Prescription Glasses. CRISP CLEAREST ORANGE IMAGE – Our eclipse viewing glasses are manufactured with scratch resistant black polymer material with an optical density of 5 or greater. This ensures that you will have the best viewing experience. Wanting more help and guidance in viewing the Solar Eclipse? There’s an app for that!! Actually, there are several! Check out these awesome Eclipse Apps to enhance your viewing experience, get more details on the apps here. Solar Eclipse Timer: The Most User-Friendly Eclipse Timing App Available! Get To The Path and It’s 2 Tap Setup! This is the only “talking” solar eclipse timer available. It is essential for first-time eclipse observers, but also sophisticated enough for expert eclipse chasers. Auto geolocation; Auto Contact Time Calculation; Auto Duration Calculation; Max Eclipse Mark; Spoken Phenomena Reminders; Spoken Countdowns; Partial Phase Image Sequence Calculator: Built-in Totality Video. GPS Converter: This app was developed for an emergency situation and has only one function as a companion app to Solar Eclipse Timer. This free app takes DMS format GPS values, like from your car’s GPS, and converts it into the decimal format for use in Solar Eclipse Timer. What if your position on the path has no cellular service or cell service goes down on eclipse day and your mobile device is not properly receiving native GPS satellite signals? Eclipse USA Quiz Game: The only mobile eclipse education game released for 2017. Two quizzes are free; Solar Fun Quiz 1 has 50 basic eclipse questions and Eclipse USA Quiz has 25 questions about the path across the USA. In-app upgrades include a more difficult eclipse quiz, Eclipse Pro Quiz 2 and also combination quizzes including separate quizzes dedicated to the 12 states in the path. Totality Observer: For children and for fun, an arcade game to start their interest in eclipses. The theme; your child is an eclipse tour guide, he or she must move the clouds to get the guest’s eyeballs to totality! 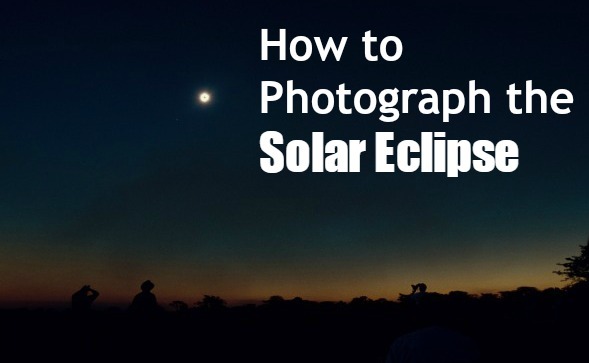 Wondering how to photograph the eclipse with your phone? Check out the article that I wrote about ECLIPSE PHOTOGRAPHY WITH YOUR PHONE: 5 IMPORTANT TIPS for the Hilton Mom Voyage blog. Some very helpful tips and ways that you can get even more out of this epic event! Don’t miss the first USA total solar eclipse in 38 years!